Deputy Mayor Bassett declared a conflict of interest in relation to item 5c) 4d) (UrbanPlus Limited). Cr Cousins declared a conflict of interest in relation to item 5c) 4b) (Hutt City Community Facilities Trust). Cr Milne declared a conflict of interest in relation to item 5c) 4c) (Seaview Marina Limited). For the reason that there is currently no on-street mobility parks provided in the area. The proposal will improve accessibility to the wharf, beach and shops for mobility impaired road users, with minimal loss of unrestricted user parking spaces. For the reasons that the proposed restriction will improve accessibility to the complainant’s business and improve safety in the vicinity, although four on street parking spaces will be lost, there is adequate on street parking available within the immediate area, the surrounding businesses support the proposal and the proposal is in keeping with Council’s Parking Policy. For the reasons to prevent vehicles being parked too close to the intersection and driveways, improving vehicle manoeuvrability and visibility; and to improve compliance with the Land Transport (Road User) Rule 2004. For the reason that the proposed restriction will improve the level of service for accessibility and sight distance within the cul de sac turning area; and the installation of No Stopping At All Times Restrictions attached as Appendix 1 to Report TRS2018/1/11 will promote compliance with the Land Transport (Road User) Rule 2004. For the reason that it will ensure adequate carriageway width for two way traffic along the sharp bend at the entrance to the street. For the reason that the proposed changes will improve the sight distance for vehicles exiting these driveways, without reducing the number of on street parking spaces. For the reason that the proposed changes will improve accessibility to the street and road safety in the vicinity of blind corner. For the reason that the proposed changes will improve accessibility to the street and road safety in the vicinity of the driveway. For the reason that the proposed changes will improve the road safety level of service for the residents of Nos 90 and 90a Dowse Drive with no loss of on-street parking. For the reason that the proposed changes will improve the sight distance for vehicles exiting the Petone Working Men’s Club without reducing the number of vehicles that can park on street. 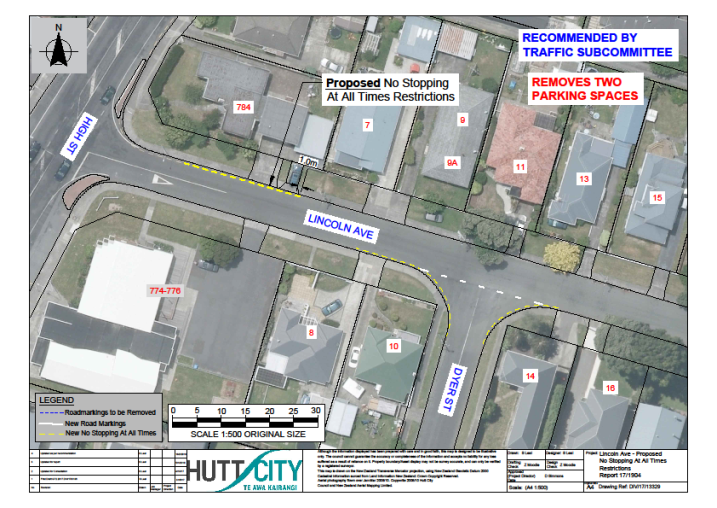 For the reason that the proposed changes will improve accessibility to Lincoln Avenue and road safety in the vicinity of the intersection with High Street and retain two parking spaces. For the reasons that it will ensure adequate carriageway width for two way traffic along the sharp bend at the entrance to the street; and to increase the availability of unrestricted parking spaces for residents and their visitors during the weekends. For the reasons that the proposal would reduce the likelihood of drivers parking in unsuitable locations along the street and improve road safety and accessibility in the area; and the proposal would promote compliance with the Land Transport (Road User) Rule 2004. For the reasons that the parking restrictions improve the level of service for accessibility and road safety; and that existing parking restrictions need to be formally resolved by Council so they can be legally enforced. For the reason that parking restrictions need to be formally resolved by Council so they can be legally enforced. For the reason that there are limited parking options for parents and caregivers dropping off/picking up children at the childcare centre. For the reason that the proposed changes will improve the levels of service for accessibility and road safety for the residents of Nos 18, 20 and 23 Collingwood Street, with little impact for on-street parking availability. For the reasons that the proposed changes will improve the levels of service for accessibility and road safety in the vicinity of the intersection; and the proposed restrictions will prevent vehicles from parking within the intersection and promote compliance with the Land Transport (Road User) Rule 2004. Initial proposal developed and approved by Policy and Regulatory Committee (30 April) and Council (22 May). Workshops to be held during the period 1 February to 31 March. Public notice of initial proposal notified through public notice. Submissions called for. Submissions considered and amendments (where agreed to) made to initial proposal and final proposal agreed at Council meeting 24 July. Final proposal notified through public notice. Appeals and objections. Close 31 August 2018 and appeals and objections forwarded to Local Government Commission. Appeals and objections considered by Local Government Commission. Local Government Commission makes determination. For the reason that the current Trading in Public Places Bylaw 2008 needs to be reviewed. Cr Cousins advised that public consultation had occurred and that the recommendations from the Policy and Regulatory Committee included regular monitoring. Mayor Wallace explained that, due to concerns, he had met with officers and had been assured there would be additional signage erected, with a high presence of Council’s Animal Control Officers at the commencement of the controls. In response to a question from a member, the General Manager, City Transformation advised the additional officer hours spent at Avalon Park were covered by existing budgets. She added that it may result in less officer time spent on other matters. Cr Barry expressed concern with mixing children and dogs at a playground. He stated that he had confidence in the officers. He believed playgrounds were for children not dogs and that Council had opened other more suitable areas for dogs. Cr Milne expressed support for the proposal alongside the additional monitoring. For the reasons that a Citizens’ Panel Survey has been undertaken and the results indicate that little extra would be gained from further consultation. Cr Cousins declared a conflict of interest and took no part in discussion or voting on the matter. Cr Briggs requested a workshop be held prior to the Finance and Performance Committee first meeting of the year to discuss the Statement of Intents (SOIs) to enable meaningful feedback from Council. The General Manager Corporate Services explained that a worthwhile workshop should provide strategic direction prior to the Council Controlled Organisations formulating their draft SOIs. A workshop should occur prior to Christmas each year. Cr Milne declared a conflict of interest and took no part in discussion or voting on the matter. Mayor Wallace commented that Seaview Marina was turning into a success story, becoming one of the most outstanding marinas in the country. Deputy Mayor Bassett declared a conflict of interest and took no part in discussion or voting on the matter. Speaking under public comment, Mr M Shierlaw spoke in support of the review which he considered would enable learnings to be applied to any future purchases. He expressed concern that there was no scope set for the review. He questioned whether the opportunity for a government department to relocate to the premise was overstated. He asked Council to investigate whether the transactions between Council, the hotel and USAR were interdependent. He cited the report stated there was no advantage given to USAR over the other bidder. He asked Council to consider discussing these matters under public business with consultation undertaken under public excluded. He asked that the review be undertaken by an independent consultant, acknowledging there would be cost involved. The Chief Executive advised that, as a result of the public comment speaker, he would investigate the possibility of public consultation regarding Council property purchases and report back as part of the review. He further advised that appointing an independent consultant to carry out the proposed review was discussed at committee level. It was agreed that it would be too costly, with members believing that officers were qualified to undertake the review. Cr Milne commented that a review of the process was good practice, especially given that there was potential for Council to be involved in significant property projects in the future. He suggested officers investigate how other Councils undertook property purchases as there would be good practice guidelines in existence. Cr Barry commented that reviews were good practice and ensured the process in place produced the best outcomes for ratepayers. The Divisional Manager, Parks and Gardens elaborated on the report. The Divisional Manager, District Plan elaborated on the report. He highlighted that there had been no submissions received to the proposed Plan Change. Mayor Wallace thanked the officers involved in the work required for the Plan Change. The Divsional Manager, District Plan elaborated on the report. Mayor Wallace thanked the officers involved in the work required for the proposed Plan Change. Memorandum dated 28 February 2018 by the Divisional Manager, Democratic Services. Mayor Wallace explained the importance of the certification and recertification for Resource Management Act (‘RMA’) decision makers. He noted that while the recertification process was daunting, it provided great personal development and increased knowledge and skill about the RMA. In response to a question from a member, Cr Cousins advised that a review of the District Plan was currently underway which may involve more hearings than usual. Mayor Wallace advised that he was unable to attend the conference due to competing commitments. He highlighted the issues that would be addressed at the conference. Cr Lewis elaborated on the Te Maruata Subcommittee conference. The Chair of the Hutt City Youth Council (Youth Council) stated that she was pleased with the Inclusiveness Plan. She noted that the Inclusiveness Plan Advisory Group would be included in Council consultation exercises as currently occurred with the Youth Council. “That the report of the meeting held on 27 February 2018 be adopted”. “That Council approves the affixing of the Common Seal to all relevant documents in connection with the items specified in Schedule 1 in accordance with Standing Order 18.2. The withholding of the information is necessary to protect the privacy of natural persons.(s7(2)(a)). The withholding of the information is necessary to maintain legal professional privilege(s7(2)(g)). The withholding of the information is necessary to enable the local authority to carry on, without prejudice or disadvantage, negotiations (including commercial and industrial negotiations)(s7(2)(i)). There being no further business the Chair declared the meeting closed at 7.03pm, and the non-public portion of the meeting closed at 7.15pm.